Who do You Trust for Protection? For most of my life, I could only wonder at what is was like to be protected. I longed for that kind of protection that only a daddy could provide. I longed to feel like I was worth being protected. As I got older, I threw myself, head first, into horrible situations in hopes that it would be in that situation that a man, any man, would step up and protect me (it’s only in retrospect that I know the reasoning behind why I was doing such crazy things). But all the reckless behavior and perpetual lies only led to more disappointment and resentment when no one ever protected me they way I thought they should. Through a series of unexpected, but fortunate, events, I’ve come to know that there’s only One who can protect me the way I want; the way I need. And I can’t expect my husband, my parents, or anyone else to protect me the way God can. Last week, I was driving Robert’s truck down the highway at 70 mph with my parents and my kids in the truck. Out of nowhere a car comes over into our lane, running us off the road in the process. As soon as I saw that car, I gripped the wheel as hard as I could and swerved onto the shoulder, I was all I could do to control the truck once it hit the gravel and I did not think that I was going to be able to control it. I was sure that we would were going to crash into the guardrail. But somehow, the truck came to a stop. Shaking and scared, I looked at the backseat; my girls were safe, smiling, and ALIVE! But that’s when I noticed that Rylinn (2 years) had pulled her arms out of the straps in her car seat. IF we had wrecked, she likely would have been killed. If the car had hit us, the truck, most likely, would have flipped because of the height of the truck, the lowness of the car, and the slight angle of the road. I believe, had that happened, my mom, who was in the passenger seat where the car would have hit, and Rylinn would not have survived and that Mackenzie (3 years), my step-dad, and myself would have all been severely injured, if not dead. I don’t know what the outcome would’ve been if we had hit the guardrail, but I don’t think it would’ve been pretty and I don’t think Rylinn would have survived that either. These scenarios have played over and over in my mind and each time I think about it, I am simply amazed by God’s power and His great, great love. After later talking about it, my mom told me not to give myself so little credit about not being able to control the truck because I did great and she was proud of me. But here’s the thing, I don’t think I stopped that truck – God did. It was definitely a “Jesus, take the wheel” moment. It only last a few seconds but it felt like hours and it was, quite possibly, the most terrifying moment of my life. It was a moment where, I believed, the lives of four of the people I love most in this world were in my hands and my actions would either save them or kill them. But what I’m realizing in retrospect is that their lives weren’t in my hands at all, they were, and are, in God’s. That was the first time in my life that I have, that obviously, witnessed God’s hands protecting me. If it were only within my power, I would’ve lost control of the truck and we would’ve wrecked. I am so very thankful that I don’t have to go through life on my power alone; that God is with me through every step. So my next point is about trust. Every day we trust in so many things, without even realizing it. When we get in our cars, we trust that they will work properly and get us safely to our destination. When we get on the road, we trust the drivers in the other vehicles to drive safely and abide by the laws of the road. When we eat at a restaurant, we trust that food we are ingesting will not make us sick. The list could go on and on and on, but I’m sure you get the picture by now. We have to put our trust in something or someone, so where is it? I know that I struggle every day (at least once, if not more) with trusting in my own power when I have seen obvious situations (like the one above) where it is only by God’s power that I was able to be successful. It’s only in trusting in God’s power and protection that we will be able to make it through this world with peace and joy. This world is hectic and chaotic and dangerous and without the understand God is ultimately in control of it, we’d be lost and drowning in our own worry. I think we all struggle with thinking we’re not good enough and working hard to get where we need to be. While hard work isn’t a bad thing, hard work for the wrong reasons is. Working to get where you think you need to be is just absurd (I know because I’ve done it). God would rather we work hard to glorify Him and trust Him to get us to where He knows we need to be. This morning, I came across a beautiful thought by Oswald Chambers, “Never allow yourself this thought, ‘I am of no use where I am,’ because you certainly cannot be used where you have not yet been placed.” It made me think of where I was before I came to Celebrate Recovery. I believed, IF (and it was a BIG if) there was a God, then He couldn’t possibly love me or use me where I was. I always thought I was too broken to be of any use to the God of the universe and too bad to be loved by Him. Oh how I was mistaken!! How often do we try to get ourselves out of whatever circumstances we’re in? We, in our human nature, try to avoid pain at all costs. 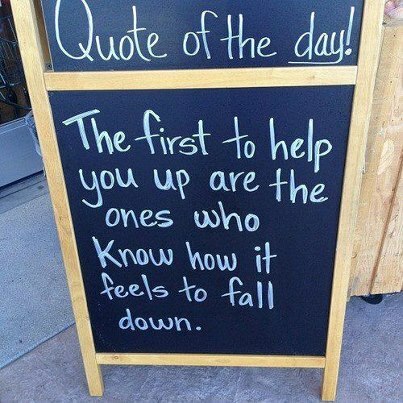 But in trying to avoid it, some of us walk straight into it. I know that’s what I did for MANY, MANY years. In trying to avoid pain, I had trapped myself under layers of masks, lies, and hurt that I wasn’t able to get through on my own. So God, being loving and faithful, sent people into my life to break down the barriers. It’s been a year since I began Celebrate Recovery, and in that year I have learned that God IS using me, right where I am. It still astounds me that God isn’t going to wait until I have my junk together to use me, but He has been using me from the beginning of my recovery (even though I didn’t believe it or see it at the time). God is using me right now, right where I am. I mean logically, He can’t possible use me where I haven’t been. And knowing that makes me thankful for where I am and where I have been. I’m not proud of my past by any means, but I no longer regret it because without it I wouldn’t be right where I am today. We live in a broken, fallen world and until Jesus returns, there will continue to be pain and heartache, but our gracious God will continue to use that pain and heartache to glorify Himself. The question is, are you willing to submit to His will for your life? Last night, I had a short talk with someone who talked about how, since he first gave his life over to Christ, all he’s wanted to do is share with other people and let others know how amazing He is. And that got me thinking, isn’t that what all of our lives should be about? I know that’s what I want my life to be about but I also know I don’t do everything I should to serve and share Him with those around me. This morning, in my devotion, I came across Matthew 9:37-38 – He said to his disciples, “The harvest is great, bu t the workers are few. So pray to the Lord who is in charge of the harvest; ask him to send more workers into his fields.” I’ll admit the reference to a field and harvesting here at first confused me a bit. But as I began to understand these verses, I was pleasantly surprised by what I was reading. Jesus is referring to people as being ripe for harvest, meaning that many people are ready to turn their lives over to Christ, if only someone would show them what that looks like. So He tells us that we need to pray that God will call workers to reap the harvest, meaning that we’ll pray that more Christians will share their faith with nonbelievers. Something I think is important to remember though, if you’re praying this prayer for God to call more people to share their faith – don’t be surprised if He calls you. We should always be prepared, as Christians, to witness to others and help lead them to Christ. I know, in my life, if it weren’t for two people in particular who, I believe, God had called to guide me to Jesus, I would have walked away from the church and never looked back. But God, knowing that and because He is faithful even when I’m not, called two people, my dad and my Celebrate Recovery sponsor, to serve Him and show me the Way. My dad introduced me to his faith, he taught me what it was about, and showed me the unconditional love that goes along with it. I was angry at my dad and rensentful for his 23 years of absence, but God still called him to show me the way to the cross. All my early questions about why I should believe, what I should believe in, and who exactly Jesus was, my dad answered. He gently guided me to God’s Word and pointed me in the right direction. It is because of my dad’s guidance that I was led to get saved and baptized. He didn’t give up on me when I, literally, laughed at him when he told that Christ died and rose again for me and that He took the punishment for my sins. He kept trying. Then there’s my Celebrate Recovery sponsor, next to my dad, she has done the greatest thing for me that any one person could do for another – she loved me through the pain of my recovery and showed me that I’m never too broken for Him to put me back together. She loved me through the shame and guilt of my past. She guided me to His Word when I thought I couldn’t keep going. She prayed for me and with me to make it through the toughest parts of my recovery. She didn’t give up on me or my recovery, even when she probably had every right to. But because of the love of Christ within her, she endured the journey with me even though it wasn’t easy – for that, I will be forever grateful. My dad showed me how to turn my life over to Christ and my sponsor helped me learn how to, daily, turn my will over to Him. My point is that if we want nonbelievers to believe and turn their lives over to Jesus Christ, then we need to be willing to share our faith with them and love them through the hard times. We need to be willing to step out of our comfort zones and bring Christ to places where His name has been rejected or misunderstood. 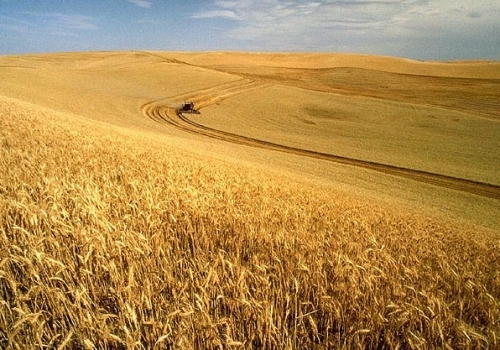 John 4:35 – You know the saying, ‘four months between planting and harvest.’ But I say, wake up and look around, the fields are already ripe. What Jesus is saying here is to stop making excuses. I know I’m not the only one who doesn’t go out of my way in some circumstances to serve others and share my faith because a part of me thinks that, that person(s) just isn’t ready to accept Christ. But that, my friends, is just laziness. Jesus tells us that people are ready to be harvested; all we need to do is open our eyes and look. So let’s open our eyes. If our faith is as important to us as we say it is…then don’t be afraid to show it. What we are really talking about here, is the eternal life of the ones we love. Are we willing to leave that up to chance? Who knows, maybe you’re the one person God is calling to bring someone to know who He is and if you don’t answer the call, no one else will. Don’t be lukewarm in your faith. When we understand what He gave for us, we are willing to give all for Him. He came not to be served, but to serve. And that’s what He calls us to do. He wants us to serve one another with joyful hearts. What makes me joyful about serving, even when it’s something I’d rather not do, is remembering that in serving others I am actually serving Him. I want to give Him my all because He gave me His. The transformations have already been great, but the best part is that He’s not finished with me yet. And if you think He can’t do the same thing in your life, you’re greatly mistaken. You are never too broken, there are never too many pieces, for Him to be able to put you back together and turn you into the masterpiece He created you to be. Finishing my Celebrate Recovery step study has placed a stronger desire on my heart to live my life for Him and to share His love , grace, and mercy with a world of broken people. Finishing my step study has taught me that if I want to keep all that He has given me, I need to give it away and not just when it is convenient for me. I’ve learned that God will use my biggest mistake/failure/heartbreak (whatever it is that has brought me the most pain in my life) as my platform to serve Him. And now, being set free of the guilt and shame I once felt, I am free to joyfully and lovingly do just that. It is my desire to dedicate my life to broken and hurting people. Why? Because He dedicated His life to me. I am a proud Army wife. 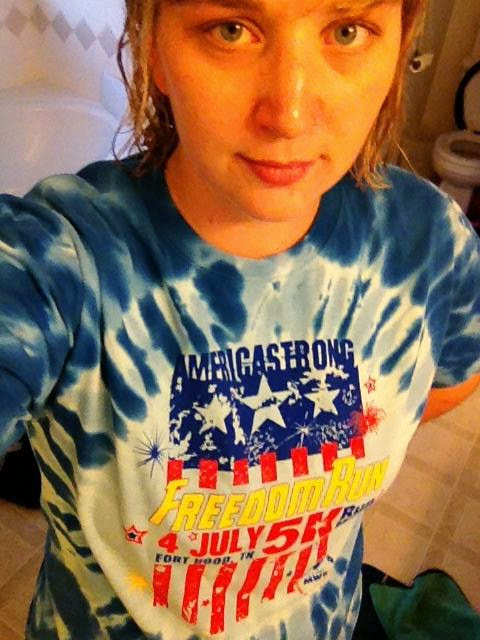 My husband proudly serves our country as our kids and I cheer him on from the sidelines. He is wonderful man. 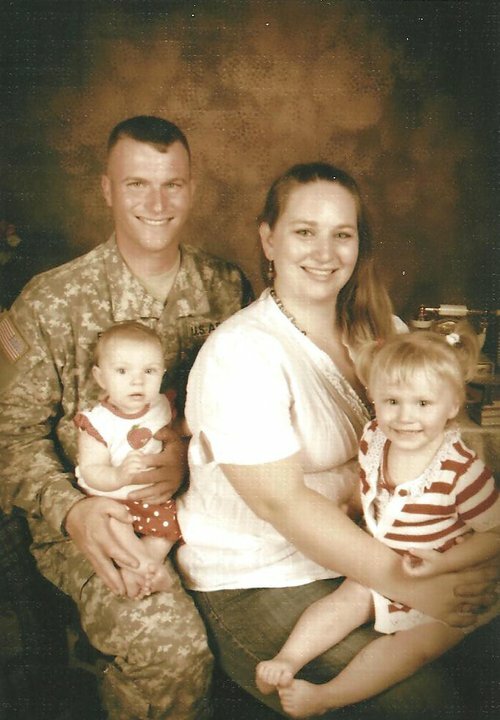 He loves his wife and kids and would lay down his life for us if need be. His job also proves that he is willing to lay down his life for people who don’t know him, let alone appreciate him. But the personal pride and honor that come with serving your country also comes with great sacrifice. 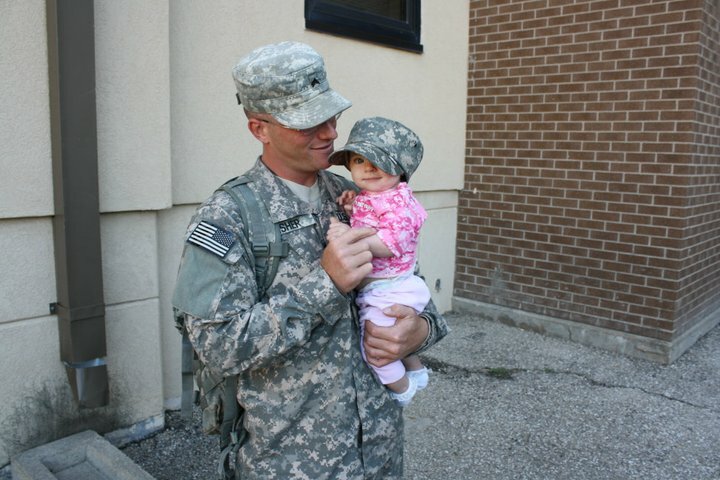 When Rylinn was a month old, Robert left for 6 months of training. We saw him twice during that time and talked on the phone regularly. But nothing will ever replace the deep sadness that we both felt about everything he was missing. But we managed to get through it, looking forward to the time when we’d be back together again. 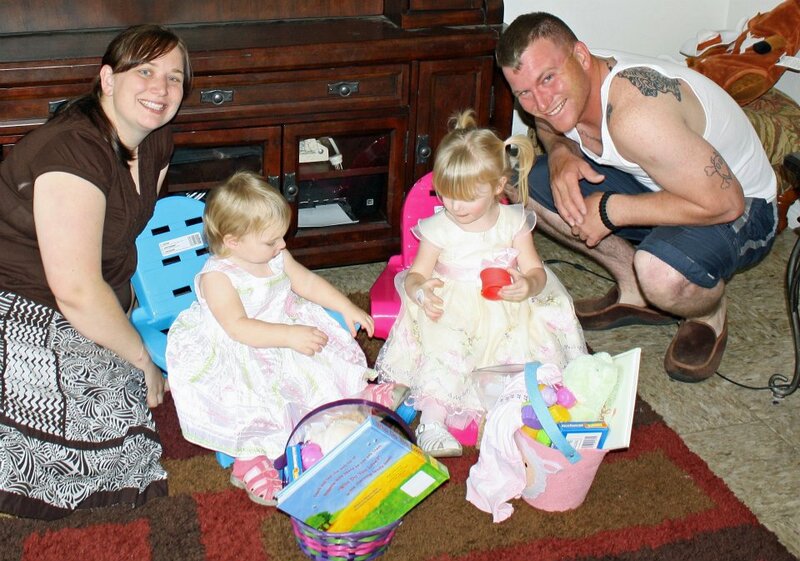 When Rylinn was 7 months old and Mackenzie was almost 2, we got to spend almost a month together as a family before he left again, this time for Afghanistan. This separation was harder. We didn’t get to talk on the phone very often and we didn’t get to Skype. Our main form of communication was through Google chat. For me, it was hard to not talk to him. I never knew how much you could miss the sound of someone’s voice. In the first 14 months of Rylinn’s life, he missed about 12 months. 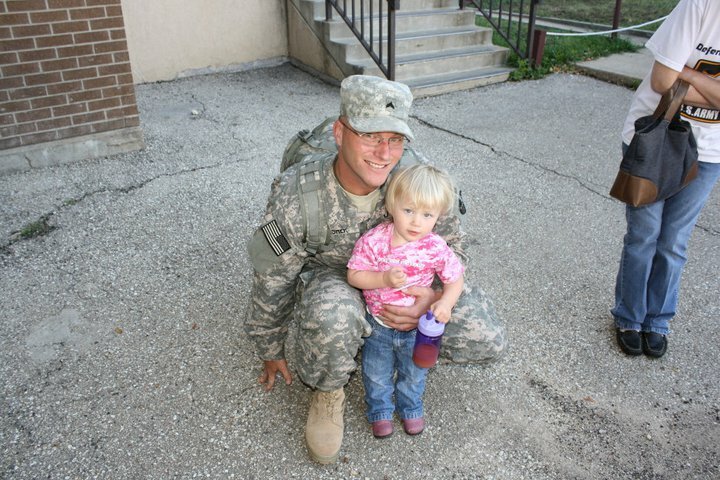 He was deployed when Rylinn turned 1 and Mackenzie turned 2. He was deployed for his birthday, my birthday, and a handful of other holidays. He missed Rylinn’s first words and steps. He missed Mackenzie’s first stitches. He missed my baptism. The sacrifice he has made astounds me and the pain he must be feeling hurts me. Rylinn will be 2 in 9 days, and he will be in the field. So now, he has missed her first birthday, he will miss her second, and, unless things change, he’ll also be deployed for her third. 1 Corinthians 13:7 – Love bears all things, believes all things, hopes all things, endures all things. And here’s my answer: I handle it because I love him. We make it through the separation knowing that one day, we’ll be together again. He misses a lot and we compensate for that by making a lot of home videos. It makes me very angry! I hate seeing the sadness in him when he misses a big event in one of our girls’ lives. But love is what gets us through and love is the only thing strong enough to get any military family through any type of separation. Jefferson Bethke has a video on marriage that says, “it’s not the love that sustains the promise, it’s the promise that sustains the love.” I love that statement and I feel like it’s a great reminder for military families. It’s good to remember, that just because I don’t feel love the way I want to when he’s deployed, that doesn’t mean that the promise we made to each other on our wedding day is any less valid. The promise that we’d love each other and be together until death doesn’t go away when physical love isn’t there. During those times of extended separation we can’t forget that it’s the promise we made to each other on our wedding day what helps to sustain our love. 1 Peter 4:8 – Above all, keep loving one another earnestly, since love covers a multitude of sins. The sacrifice that we make isn’t easy. Some say that it gets easier with time, but it doesn’t – it only gets harder. Absence does not make the heart grow fonder either, I hate that saying! God is there and He knows what I am going through. The great thing is that even when I feel lonely because my husband is gone, I am never truly alone because He is always with me. I feel like He makes His presence more known to me when Robert is gone because He knows I need that. What a loving God we serve! 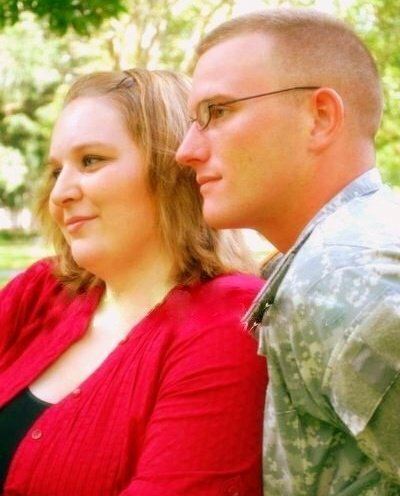 Death is a very real fear for a military spouse. We live every day not knowing if our loved one is still alive, not knowing if you’ll talk to him, and not knowing if you’ll ever see him again. If you dwell on, it’s terrifying and it’s easy to live our lives in fear of the “what if’s”. It’s in those moments of fear that I think it’s even more important to trust in God. Isaiah 41:10 – fear not, for I am with you; be not dismayed, for I am your God; I will strengthen you, I will help you, I will uphold you with my righteous right hand. We don’t have to be strong enough to handle the fear that come with deployments, but we simply need to know the one who can. Psalm 112:7 – He is not afraid of bad news; his heart is firm, trusting in the Lord. Trusting in God when the fear seems overwhelming is easier said than done. It’s hard to trust that God has it all under control and that He’s in control of what happens. I know I struggle with it. It’s hard to let go of it and give it all to God. To admit that God is actually in control of whether or not Robert comes home alive is a terrifying realization. I know that I don’t see things the same way He does and I struggle with seeing the bigger picture of things. It’s comforting to know though that He has a plan for all of us, a plan to glorify himself, whether we can see it or not. So in the meantime, we’ll pray for protection and safety, but we’ll also pray that God’s will will be done, whether I like it or not. I’ll accept God’s ways even if I don’t agree with Him. Because who knows better how anything should work than the One who created it? In the fear, in the separation, in the sadness, and the pain, I will turn to God because He knows! Over the past few weeks I have been bombarded, in nearly every study I have been doing and books I have been reading, with the truth of who I am in Christ and who I was made to be. I did not realize it until a few days ago, but it seems like God is trying to tell me something. Something I really need to tune in and listen to. Ephesians 1:5, 13 – he predestined us for adoption as sons through Jesus Christ, according to the purpose of his will…In him you also, when you heard the word of truth, the gospel of your salvation, and believed in him, were sealed with the promised Holy Spirit. When I came to know Christ, almost a year ago, I did not know who I was or who He was for that matter. I was lost, with no clue how to get to where I needed to be. It’s like I was wandering in the mess I had made of my life and I did not know where to begin to get out. It seemed the more I tried to fix things, the worse I made them. It was a cycle…a cycle that I was trapped in. Then, as a crazy turn of events, I met my dad. With his faith, he contradicted everything I had believed. And through a series of serious and life changing conversations, my dad led me to believe that this whole Christianity thing might not be so crazy after all. Through another series of unexpected events, my mother-in-law led me to Celebrate Recovery. When I first showed up there, I was like, “Seriously, what am I doing here! !” The first lesson I heard at CR was on Sanity. The definition of insanity is doing the same thing over and over again expecting a different result. It was when I heard that, that I realized there might be something wrong with me after all and maybe this program would be good for me. I felt like I had spent the previous 24 years of my life doing the same things over and over and over and over (you get the picture) and always expected something to be different. It never dawned on me that if I wanted things to change – I would have to change. But the thought of me having to change terrified me. I did not like who I was or where I was headed, but changing meant facing the unknown and I did not know if I was ready for that. You see, my life had been built up of mask upon mask, and removing those masks terrified me because I did not know who was under there and what if, when all the masks were removed, I found out I hated that “me” just as much as I hated the masked “me”. But God put some wonderful people in my life to help me through the scariest parts of the transition. As I began my Celebrate Recovery step study, I was forced to answer some hard questions about myself. I really had to look at myself and look to the core of my emotions and pent up feelings. It was quite overwhelming when I realized I had suppressed my feelings for the last 24 years and was forced to face them. I’ve never known how to deal with anger, sadness, frustration, betrayal, etc. For most of my life I just pushed those feelings away because I was afraid to feel them, but I was learning I had to feel them if I wanted to be healthy. So I processed through things that hurt me when I was 8 as well as things that hurt me just the week before. The feelings were all so fresh that is didn’t feel like there was any time lapse. Throughout most of the journey, I struggled with who I was in Christ. I struggled with seeing myself as God sees me and not as the world sees me. I struggled with not being ashamed of myself and who I was because He isn’t ashamed of me. I struggled with realizing that He really could love me even after all I had done. But thankfully, God gave me a wonderful sponsor and spoke words of love and wisdom into my life. She helped me to see that I am loved and I am cherished by my Heavenly Father. I never got to be “daddy’s little girl” growing up, and that is what I wanted more than anything else. And even though I now have a healthy relationship with my dad, a relationship that I wouldn’t change for anything, I will never be able to change those years of longing for him and I will never be able to go back in time and be “daddy’s little girl”. But what I now know is that it’s not too late to have that relationship with God. I am His daughter and He wants me to come to Him, as a child who just wants to crawl up in her daddy’s lap and know she is loved. Psalm 68:5 – Father to the fatherless, defender of widows–this is God, whose dwelling is holy. Over the last year, specifically the last eight months, I have come through a tough battle with myself and drawn closer to God. I have cried, I have laughed, and I have felt more love that I ever knew existed toward me. I have learned who I am in Christ and I have been able to rest in that. 1 Thessalonians 1:4 – For we know, brothers loved by God, that he has chosen you. But now that I am nearing the end of my step study and planning to share my testimony and become a leader at Celebrate Recovery, I have been faced with a lie that I am not good enough. I have forgotten who I am in Him and for the last few weeks I have been faced with an immense amount of insecurity about who I am. I have really struggled with fear of becoming who I used to be, forgetting that Christ died so I could be set free from that slavery and because of Him, I now have the power to say no to temptation and turn away from my sin. Thankfully though, God hasn’t given up on me and He still continues to show me more love and grace than I deserve. He continues to pour His blessing into my life. In the last few weeks, He has really been showing me that I am who He says I am, not who I believe myself to be. After all, He made me and He knows me better than I do, I’d rather believe and trust Him anyway. Romans 8:17 – and if children, then heirs—heirs of God and fellow heirs with Christ, provided we suffer with him in order that we may also be glorified with him.